This week’s Treehouse Hero entry is a bit of a silly one, and requires no explanation. This elevating innovator is named Ethan Schlusser and comes from Idaho, USA. 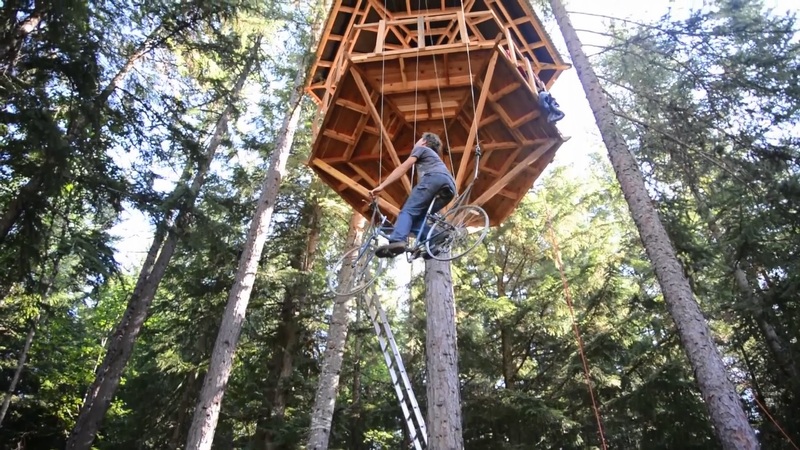 Ethan says his reason for constructing such an unorthodox route to his treehouse was simply that he “got tired of climbing a ladder six and a half million times a day”. Well, we can’t argue with that. At Blue Forest, we’re no strangers to creative ways to get in and out of a treehouse, whether it be the 11m tall slide as seen on the Pensthorpe Wildrootz Treehouse, or the 80 yard zip wire descent that can be found at the Living The Highlife Treehouse. A floating bicycle attached to a pulley though? That’s a new one even for us. He maintains that the whole system is secure and won’t simply go into free fall if any single part breaks. However, his contention that “even if it did fall, I would most likely survive; it’s only 28 feet” isn’t the most comforting thought, and it’s probably something we won’t be trying anytime soon. Still, we salute your free-thinking spirit and ingenuity Ethan, and we wish you many safe trips up to your treehouse in the future!